(CNN) - Republican presidential candidate and Texas Gov. Rick Perry will not attend the Palmetto Freedom Forum of GOP candidates Monday night, sponsored by Sen. Jim DeMint, and will instead return to Texas to deal with the wildfires in the state, DeMint and the Perry campaign told CNN. The South Carolina senator's office said they learned of Perry's plans not to attend the Columbia, South Carolina event Monday morning. "The Governor is in close contact with emergency operations officials regarding fires in Texas, including calls with his emergency management chief this morning," Perry's campaign communications secretary Ray Sullivan told CNN. "Governor Perry is cancelling the remainder of his South Carolina schedule today (including DeMint Fourm) and his California schedule tomorrow in order to return to Texas ASAP." Six declared presidential candidates, including Perry were scheduled to participate in the Forum, led by DeMint, a leading voice in the tea party movement. 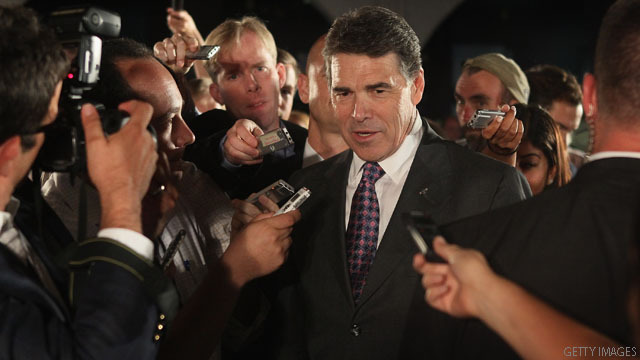 Perry will now fly back to Texas after participating in a town hall in Conway, South Carolina Monday morning. He has also canceled a trip to California Tuesday, according to Mark Miner, national press secretary for the campaign. Perry is just like Trump, all stomach gas and no antacid. Trump ran on the birther issue and flamed out, and Perry ran on the tea-vangelical platform, and flamed. The baggers are desperately looking for the nastiest anti middle class republican candidate, and they jump on the bandwagon of anyone who can lie with a straight face in the name of Christianity. GOD is sending Perry a big message... STAY HOME. To those thinking Hillary would run as vice president with Obama, no way! She does not want second place. If she ran, and I doubt she will, it would be for the number one spot. She will wait until 2016 and be a shoo-in after the Republicans bring our country down even further. Whether it's Perry or Romney, the result will be the same. We'll live through hell for four years and then Hillary will step in. I hear we're using Blackhawks to dump water on the fires. Could those be "Federal" assets? Surely Perry wouldn't want "guvement" helicopters putting out Texas fires! Wouldn't that be a socialist fire department? I recommend Perry drop down in the middle of the fire and simply pray it away. Perry would abolish social security for the people who lost their homes. He is going to apply for federal disater aid, while hollering about state rights. He has to check on the "nucular" waste dump his donator/friend Simmons is building 14 feet above the Ogallala Aquifer. in danger of becoming contaminated. What a guy. Friends before Country. In a word: No guts! This guy is the biggest fake (not to be confused with the "Flake") to come out of the Tea Party. He's probably trying to get the second edition of his book out to correct all the errors in the first edition! you people clearly have no idea how serious this fire it is. it is the worst one we have faced this year and it is taking homes and lives. i don't like the man but he should have been here yesterday. it is utterly devastating. I was so looking forward to the "Demint Forum" with Perry being a participant. I was not surprised that Perry "bailed", though. I am curious what the TP-er's response will be. Will they accept the reason (Perry's needed at home in Texas to supervise the fire efforts) or see it as an excuse to avoid answering some very pointed questions? Will they turn their backs on Perry? Are the bulk of TP-er's just ignorant, vocal, white-racists or people really interested in legitimate social change? We will see how Perry's poll numbers behave in order to answer the last question. Why can't he have the prayer for Jesus to stop the wildfires on a conference call? And I was so looking forward to see Perry debate. I'm "Fed Up" with Perry dodging debates lol I thought Texas was known for cows not chickens. lol The real fun will be when Palin jumps in the race. Always interesting to read the views of the "tolerant" left in America. So much for listening to the president's call for civility. The only reason I can think of that Slick Rick Pay-to-Play Perry would visit California is to go collect checks in conservative Orange County. That's about the only California location with a concentration of conservatives who have the size of checks Slick Rick would be looking for. Inland California can be pretty conservative, but they're mostly the poor conservatives who are of no interest to Slick Rick. If Perry asks for a federal hand-out Pres. Obama should make him come to the White House and take the check from Obama's hand and take a photo. I'm tired of these welfare state Teabagger Republican governors bashing the President and federal gvt in private while they take hand outs in private. @patcee – I can go for that too – Hillary 2016!!! I would love to see her there no matter what position – P or VP!! Her experience BEATS every woman on the RIGHT and she's CLASSY about it!!! Perry , it's about time you fly back to Texas on the stats money ! Drought , fires and the new deficit in your state . Is this Perry's jobs plan? Keep the fires burning so that you can keep those firefighters, helicopter pilots, etc. employed and then in the aftermath, you have construction and real estate jobs. Brilliant! !